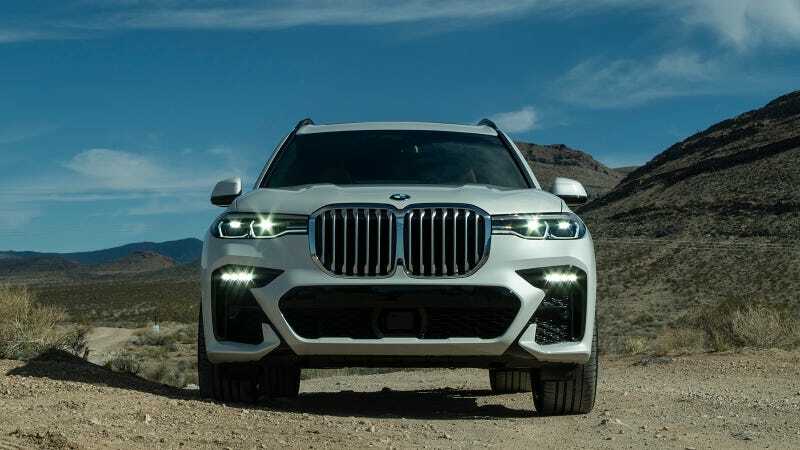 The 2019 BMW X7 is the German automaker’s latest low-flying luxury barge. You may or may not care about what it’s like to drive, but the car has enough neat gadgets that I couldn’t resist revisiting it. The X7 is a lot more luxury than sporty, so the interior is slathered in illuminated opulence. Behold–all the X7 features I thought were kind of neat but didn’t quite make it into the First Drive writeup. Most cars have little lights on their door panels that illuminate when the doors are open. The BMW X7’s are this pulsing LED strip, neatly tucked into the door design. It looks almost exactly like the “red alert” lights in Star Trek: The Next Generation’s Enterprise D, and if you can’t appreciate that, well, that’s just too bad. The X7’s optional ashtray fits into the car’s cupholder, and I actually thought it was another control knob for the infotainment system at first. Upon closer inspection, it kind of looks like a beer can. The fact that BMW chose to set up its ashtray this way, instead of integrating it with the interior design, is interesting. The reasoning is pretty simple–an ashtray is important in some markets, and not at all in others. I just liked it because this is exactly the kind of weird, random factory automotive accessory I enjoy finding on my automotive archaeology trips to junkyards. The Alcantara-wrapped rear seat pillows look like another odd afterthought in the otherwise extremely sleek and elegant X7 interior. But, what can I say, they feel as comfortable as a five-star hotel bed after a one star transcontinental flight. While the silver speaker trim inside the BMW X7 looked lifted almost directly off the Mercedes-Benz S-Class, the lighting inside the tweeters that look like a cyclone looks pretty cool. Ambient interior lighting in cars has been around for a long time, even some Kias have a form of this now, but I’ve never seen light cost into a glass roof quite like this before. I did all of my X7 driving during the day, so I didn’t really get to appreciate until pulling into a valet line in the early evening. But it is pretty darn cool. The BMW X7’s key, which is about the size of an old Nokia phone, can do a lot more than just lock or start the vehicle. It can also tell you how much fuel the vehicle has, set itself to adjust the temperature before you get in, and do other things. The car can also feed your smart phone this information through BMW’s app. You might have seen this third-person parking camera view in other BMWs and Rolls-Royces, but I cannot get over how cool it is. Basically, one of the car’s computers is extrapolating an impossible perspective from the images it’s digesting from an array of cameras, making it appear that you’re looking at the car from the outside. That black chunk at the top of the X7’s gauge cluster is a monitoring system. Through that lens, the car watches the driver to catch fatigue or inattentiveness. If the car decides you’re nodding off or spacing out, it will send you notifications or kick off its “self-steering” functionality. So many people have asked me what the actual physical dimensions of the X7’s enormous snout actually are. It pains me to admit that I forgot to bring my tape measure to the launch event, but I did ask a BMW representative, who got “16 inches tall and 32 inches wide” with his phone’s measuring app. The X7’s surprisingly decent exhaust note, seat massagers and climate controlled cupholders could get a mention here too, but I always drink my coffee out of a $30 Yeti cup on the road so I couldn’t really tell you if the BMW’s cup warmer worked. Those seats though, man, I could have sat in them and enjoyed all these other fun features forever. What Do You Want to Know About the Colossal 2019 BMW X7?